On SALE while they last for $4. Two great license tag frames: Marine Mom and God Bless The Marines. 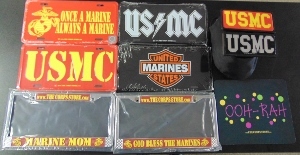 Four license tag to choose from: United States Marines, USMC in red and gold and also black and white, and Once a Marine Always a Marine. Hitch covers in traditional red and gold or black and silver. Also an OOH-RAH mousepads for only $4.